A European Commission ban on British beef exports has officially ended, 10 years after it was imposed to prevent the spread of mad cow disease. Live cattle born after 1 August 1996 can now be exported, as can beef from cattle slaughtered after 15 June, 2005. Some EU states have yet to amend laws to allow UK imports. Meat producers have welcomed the move, but animal rights campaigners plan protests at the condition under which some British calves are transported. 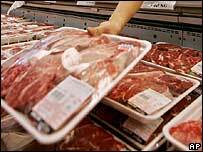 Restrictions will remain for beef containing vertebral material and for beef sold on the bone. European officials agreed to lift the ban as cases of BSE dropped in the UK. Before BSE, the UK beef industry was worth more than £500m a year. The Netherlands, Greece and Italy are expected to be the first major markets for British beef after exports resume, with orders from foreign buyers already received. Imports to France, previously the largest buyer of British beef, are set to resume on Thursday following the lifting of local restrictions. The National Farmers Union said British beef had long had a reputation in France for its quality. But with many restaurants now using French-reared cuts or imports from other countries, reports have suggested some may be reluctant to switch back. "It's all about rebuilding confidence," said a spokesman for the NFU. "We anticipate some resistance but it is well known that the French particularly liked British beef, especially Parisian restaurants." Farmers say lifting the ban will help re-build their multi-million pound overseas market. This may take a while, warned the director of the British Meat Processors Association, Maurice McCartney. "The quicker our beef market is normalised, the better," he said. "This is a first step. We can't expect everything to happen at once but the prize is a huge one." Beef producer Richard Phelps, who farms in Wiltshire, told BBC News that the end of the restrictions was great news. "The lifting of this ban has a huge impact on our business and a very positive one. "Over the last 10 years, we've been restricted as to where we can sell our beef. "We're now really pleased that another big customer, Europe, is coming back on to the marketplace." However, Compassion in World Farming said the transport conditions under which 500,000 British calves were exported caused "immense" suffering to the animals.